In September we spent three days in sunny Barcelona working on a promotional video for the new Ford EcoSport. 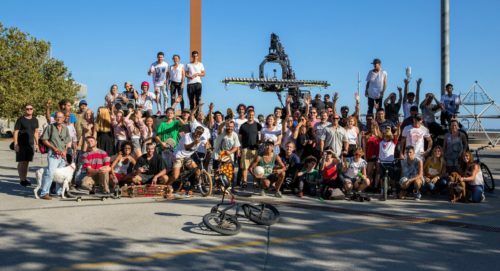 The video consists of a single continuous shot where numerous different athletes perform acrobatics, BMX jumps and skate tricks all around the car. The camera system for this project was very unique. We used the TimeSlice GoPro array, which was made up of 36 camera’s all lined up and synchronised with pixel accuracy. The part that made this setup particularly unique was that we had a giant jib on the back of a flat bed truck, with an equally large stablized gimble head on the end which the GoPro array was mounted to. This whole setup allowed for super smooth tracking shots, and meant we could achieve difficult camera angles at any elevation. During postproduction, the GoPro array footage enabled us to create a frozen bullet time effect on any of the action happening throughout the shot. Capturing the whole sequence in one continuous take proved quite a challenge. There were 26 athletes taking part, and everyone had to perform their action perfectly on cue, in exactly the right position and of course whilst landing the tricks. The whole shoot was a lot of fun, with a great team full of all kinds of interesting people. It’s safe to say this was probably one of the most enjoyable projects I have worked on this year.